Two books one blog. There’s a reason for that. I read the last page of Silent Scream and immediately opened the first page of Evil Games. I don’t like giving plots away so I’m not going to talk too much about the story line of each of these, I’ll just talk about the writing and main character. I enjoyed these books more than most others I’ve read over the last few years. Angela Marsons has created a brilliantly complex character in Detective Inspector Kim Stone and hopefully we’ll have a few more outings with her and her team in the future. Silent Scream introduces DI Stone in a tale centred on child abuse at a Local Authority Home. Are current day murders linked with abuse at the home? In todays society we are becoming more aware of these abuse cases and it makes the book relevant and up to date. Stones own history mirrors that of the children who stayed at the home, and her back-story is slowly revealed as the book moves on. The conclusion of the book is not as easy to predict as some stories of the same genre, and with twists and turn to the very end this book is a great read. Evil Games follows on, but can be read separately, from Evil Games. In this book Stone identifies the link between several serious crimes, including a murder. More of Stones back-story is revealed and the reader is given a greater insight into her psyche. Along the way Stone comes into contact with her nemesis and an intellectual and psychological battle takes place that kept me enthralled right to the end of the book. Twists and turns throughout show that Angela Marsons has a knack for complex plots without resorting to fanciful and unbelievable stories. Angela Marsons has set these books close to where I live. Her descriptions of the places and people are perfect. It is a testament to her that at one time in the Evil Games I shouted out loud that she had something wrong, only to realise she was inventing a shop in which a suspect child abuser was working, maybe it is best to use a fictional premises in that case. Further testament to her research skills is found in the derelict children’s home she uses in Silent Scream. It used to exist, it had a bad reputation amongst the locals, and it had a fire. I know this because I investigated it when I was still in the Fire Service. 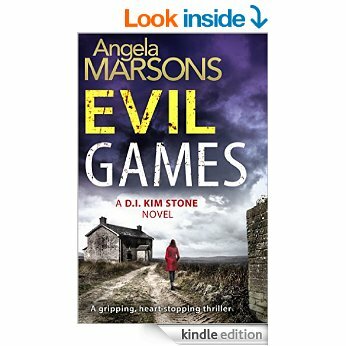 I have a feeling that, like many other authors, Angela Marsons is only published locally. One of the great things about e-books and companies like Amazon is it has allowed me to read books by people I would never have had access to by simply walking into my local shop.